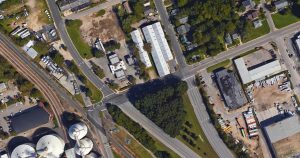 DAVEN PORT prepared traffic signal upgrade plans for permitting and construction on four intersections for the City of Raleigh. The traffic signal design plans provided for the addition of signalized pedestrian crossings across the southbound and westbound approaches at South Blount Street and Hoke Street; across the eastbound approach at South Person Street and Hoke Street; across all approaches at Oakwood Avenue at Raleigh Boulevard; and across all approaches at Yonkers Road at Raleigh Boulevard. The signalized pedestrian crossings incorporated accessible pedestrian signals (APS) in accordance with Chapter three of the City of Raleigh’s Comprehensive Pedestrian Plan. The traffic signal upgrade plans were designed to City of Raleigh and NCDOT standards. Copyright © 2019 DAVENPORT. Powered by WordPress. Theme: Spacious by ThemeGrill.